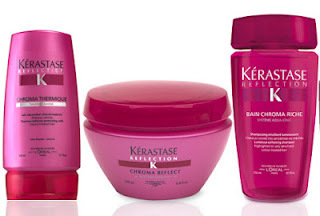 A month ago I had my hair cut, dyed and ombred (which is still dye, technically, bleach wasn't involved in the process) and the stylist advised that I should use the Kerastase Chroma Riche range (which the salon was obviously selling) to keep my color nice and vibrant for longer. I had used cheaper products meant for color treated hair before but I thought that since I was finally getting a good dye job and ombre and all that jazz, investig in good products was a good idea. 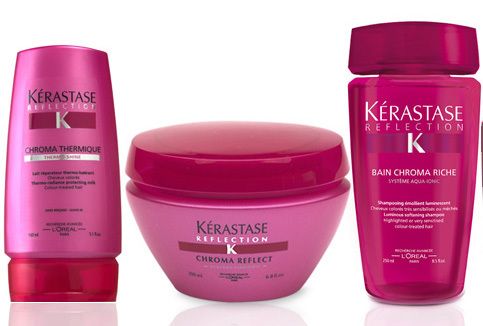 And since Kerastase is so much hyped, why not give it a try. So I got 3 products and am going to run you through them. I was very surprised to discover that this is not SLS (sodium laureth sulfate) free, when SLS is supposedly what strips the color off your hair. The texture is nice, the smell isn't really prominent, it lathers quite well (of course, it's full of SLS) and it didn't irritate my scalp. I can indeed say that my color has lasted quite well and that, a month later, the fading is really minor. I have to confess though that the dye used is not my usual one and I have no previous experience with this one (which is the new L'Oreal Professional INOA system) so the longevity might come from the dye as much as from the shampoo, I wouldn't know. The most expensive product I got. It's a pink jelly that is easy to spread and that you leave on for 5 to 10 minutes and that leaves the hair smooth and shiny. The ingredients lists are different but the look and feel are very similar. This one is much much cheaper (18€) but also a little bit smaller (200ml). I also noticed in the ingredients list that the Chroma Riche is full of silicones, which of course give nice aspect to the hair but can build up and do nothing repair wise anyway. The L'Oreal ingredients list doesn't mention silicones, so I kind of feel like it's an as-good-if-not-better and way cheaper alternative. This is probably the star in what I got: this is a product that you use on dry hair and leave in, before using hot tools on it. Since I tend to straighten my hair every morning (at least the front part and fringe anyway) and usually neglect using any kind of protection, I always rapidly get split ends after a cut. I haven't used this every single day but I did on most days and I must say that it does make your hair smooth and shiny and it has prevented split-ends quite well so far (I would usually already have them after a month). The tube contains 150ml but you use the smallest amount so this is an investment that keeps giving for months. The one thing I don't like is that it's quite heavily fragranced, but that doesn't linger too much once you're done using the hot tools so it's ok.
My overall opinion on the range. I can't believe that such a premium range hasn't gone SLS free yet or hasn't made effort to avoid silicones and find alternate manners to protect the heir, as some others have done. So I don't believe these are advanced formulations that are worth a high price tag. I also don't find it works so much more than the one-level-down range e.g L'Oreal Professionel Vitamino Color (which has a SLS free shampoo, by the way). The only product I would consider repurchasing is the Thermique one, because it works and is great value for money as it lasts for months. But for the rest, I'm a bit disappointed, I was expecting something way more luxurious and realy stepping up from the L'Oreal Professionel range that I had been using before. I have such a hard time trusting hair stylists when it comes to product recommendations (at least, the ones I know are benefiting from my purchases)and this is why. So often they're fed the company press release on a product, and I can tell that's the extent of their knowledge. Luckily, I have a couple good, trusted friends in the industry that I can turn to when I have questions. It's funny that you mention being surprised that the color care line of such a high-end line isn't SLS free. I recently had the same experiences when I was sent a color care line that also contained it. My personal research (both the kind that involves reviewing published scientific literature, as well as my own experience as a red-head by choice for over 20 years!) has yet to convince me that sulfates are the villains they're made out to be. A recent conversation I had on twitter came closer to solidifying my opinion that silicone-free shampoos are more marketing than science. According to Chemists Corner, "Sulfates & color loss is BS." Paula's Choice responded "Amen. We're still waiting for research to support the sulfate-free nonsense." Interesting, no? Oh dear, it is always so complicated, isn't it? However as you probably understood, I was more upset by the lack of distinctive benefits compared to much cheaper pro ranges, so I don't really see what justifies the price difference. I love the hair mask! Tbh, I wasn't a fan at the beginning (Kerastase in general) but now I have quite a few products from them, use them constantly for a long time now and I can say, my hair looks very healthy. I had some hair disaster and Kerastase helped me so much. I think my second choice brand for hair would be Bamboo (especially the Caviar range). I don't mind the cones, as long as I use a clarifying shampoo from time to time. Tbh, I used so many natural brands and now I prefer Kerastase (well, everyone's hair is different, right?). I agree with you and fully understand where you're coming from. Lovely post as always.